I adapted a recipe from the gluten free goddess archives to make it more paleo friendly and lower in carbs in an attempt to make a healthy, yet tasty, brownie modeled after one of my personal faves: the Betty Crocker version. Enjoy these brownies with a glass of almond or silk coconut milk, and no sense of guilt. Mmmmm. Preheat oven to 350°F. Grease a 9-inch square pan with fat free cooking spray; set aside. Combine the melted buttery spread, oil, and cocoa, stirring to combine. Add truvia, eggs and vanilla and beat until smooth. Add flour, tapioka starch, baking powder and salt and mix to combine. 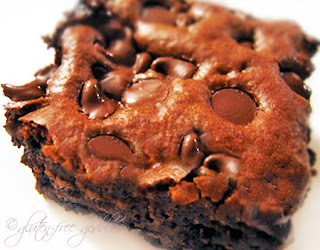 Spread into the baking pan, top with chocolate chips and bake 22-25 minutes.